Sinceit's beginning, The Salvation Army has been walking a tightrope between Faith and Action...a fall to either side would destroy the very fabric of what the Army is, and was raised up to be. It's Mission has always been a double edged sword...'Hand to man' of course but never neglecting the 'Heart to God'. I guess some would argue that there is no conflict between these two ideals...that service and action come out of a deep faith and eternal responsibility. Of course I agree with this, but, is it ever possible to really focus on these two things with equal determination and dedication? Christ Himself stated that we cannot serve two masters in Matthew 6:24. It matters because the things we do have eternal consequences, and it matters because we are not just a charitable organisation; we are a religious order with a divine commission. I know that some people's only experience of the Salvation Army may be 'secular employees' that may or may not have a faith; perhaps this is the problem, The Army has in some ways become two separate organisations: secular and religious. Although of course, at it's heart the Army still remains a religious organisation. We have to watch the dangers of becoming better known for charitable acts than faith, where faith is seen as separate or even secondary. Perhaps in today's world this is unavoidable; the need for regulation and accountability in charities means that professional employees and methods are needed particularly in an organisation the size of the Salvation Army. Yes it's acceptable that employees can be religious but it almost seems like society 'tolerates' the religious side of the Army because of the benefits of what we do. Our priorities have perhaps become unbalanced, maybe we have become to big or unmanageable? I don't know what the answer is, but it is vital we remember who we are and where we came from. The opposite side of the problem is when faith without action takes over. When we focus on the 'religious side' of the Army and neglect our mission to 'Serve Suffering Humanity'. This has become a problem with the wider Church, or at least the reputation of the wider Church; that sitting and singing songs is all we are good for; that we do not care about the world outside our walls and that we only exist to make everyone follow our rules while excluding everyone who resists or doesn't fit in. In between these two issues lies one of my favourite words: 'Balance'. Balance between who we are and what we do, balance between serving our fellow man physically and spiritually and doing all this while nourishing our own spiritual lives and walk with Christ. My own Corps is not always great at hitting the balance. We are a very busy Corps, and lots of people spend lots of time doing lots of things. We need (and I personally need) to constantly refocus to look past the busyness and constantly ground ourselves. Just a brief example from my Corps of one way we try to do that is the way in which musical practice's are organised; specifically from my experience as a songster I have found that it is vital to balance practice time to ensure we are the best we can be, as well as devotional time which provides focus and inspiration. "Faith and works should travel side by side, step answering to step, like the legs of men walking. First faith, and then works; and then faith again, and then works again; until they can scarcely distinguish which is the one and which is the other." Praying with all your might! "You must pray with all your might. That does not mean saying your prayers, or sitting gazing about in church or chapel with eyes wide open while someone else says them for you. It means fervent, effectual, untiring wrestling with God. This kind of prayer be sure the devil and the world and your own indolent, unbelieving nature will oppose. They will pour water on this flame." Discipline and discipleship are absolutely vital...there is no getting around that. Bible study and prayer are often the first things to be neglected in a busy church or corps, but it is when we're busy they become even more important! Perhaps you have found that your church has been losing focus, or neglecting discipleship, if this is the case ask God for help, ask Him what you personally can do to inspire a refocus and recommitment to put discipleship, discipline, prayer and study back at the centre of all things where they belong... don't mourn or despair in the loss of focus... get up, get out, get on your knees and do something about it! Your church needs YOU to be a light, to inspire and to set the example, prioritize discipleship, prayer and study, it is not enough to wish or to hope or even to moan about the loss or lack of discipleship...if we are to be all that we can be we have to start putting all these things first...all that we do; all the great social work and fundraising is nothing if we are not growing in faith and above all growing closer to God! Look for the balance, work for the balance. Do not become so busy you lose focus on why you are doing what you're doing. 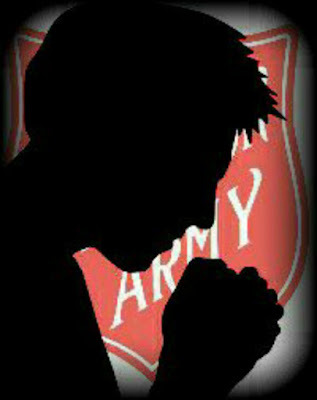 We need to remember the two part Mission of the Salvation Army and every Christian.... 'Heart to God, Hand to Man'. Both are vital and together they make an unstoppable force for good. We must be relevant, meeting modern needs with expertise and professionalism but first and foremost we are a religious movement commissioned, Inspired and equipped by God...but we have to stay connected with the source of our strength and keep our hearts focused on Christ. The more we do, the more we move out of our own strength, and the more we must rely on Christ; and the more God's light will shine in us, through us and of course out of us!